Scientists at the University of Copenhagen have become the first to reconstruct the nuclear genome of an extinct human being. It is the first time an ancient genome has been reconstructed in detail. The innovative technique can be applied to museum materials and ancient remains found in nature and can help reconstructing human phenotypic traits of extinct cultures from where only limited remains have been recovered. It also allows for finding those contemporary populations most closely related to extinct cultures revealing ancient human expansions and migrations. Finally, the discovery improves our understanding of heredity and the disease risk passed down from our ancestors. The spectacular results of the research are being published in the upcoming issue of Nature. Professor Eske Willerslev and his PhD student Morten Rasmussen, from Centre of Excellence in GeoGenetics at the Natural History Museum, University of Copenhagen, Denmark, led the international team of scientists responsible for the findings. Professor Willerslev, 38, and his team grabbed international attention last year when they reconstructed the complete mitochondrial genomes of a woolly mammoth and an ancient human. However, the current discovery is the first time scientists have been able to reconstruct the 80% of the nuclear genome that is possible to retrieve from fossil remains. From the genomic sequences, the team has managed to construct a picture of a male individual who lived in Greenland 4,000 years ago and belonged to the first culture to settle in the New World Arctic. The discovery was made by analysing a tuft of hair that belonged to a man from the Saqqaq culture from north-western Greenland 4,000 years ago. The scientists have named the ancient human "Inuk", which means "man" or "human" in Greenlandic. Although Inuk is more closely related to contemporary north-eastern Siberian tribes than to modern Inuits of the present day New World Arctic, the scientists wants to acknowledge that the discovery was made in Greenland. "I was speaking with the Director of the Natural History Museum in Denmark, Dr. Morten Meldgaard, when we started discussing the early peopling of the Arctic," Willerslev recalls. "Meldgaard who had participated in several excavations in Greenland told me about a large tuft of hair, which was found during an excavation in north-western Greenland in the 1980's and now stored at the National Museum in Denmark. "After the Greenland National Museum and Archives granted permission, we analysed the hair for DNA using various techniques and found it to be from a human male. For several months, we were uncertain as to whether our efforts would be fruitful. However, through the hard work of a large international team, we finally managed to sequence the first complete genome of an extinct human. ", Willerslev says. Willerslev adds: "It was crucial that a private person, Fredrik Paulsen, chairman of the medical company Ferring, became interested in the project and provided the necessary funding to run some pilot tests, and that The Lundbeck Foundation of Denmark, quickly followed up providing substantial economic support to complete the project". "It shows how crucial private funding is to basic science these days. Without these private donors it would have taken us a lot longer to sequence the first ancient human genome". The reconstruction serves as blueprint that scientists can use to give a description of how the pre-historic Greenlander, Inuk, looked - including his tendency to baldness, dry earwax, brown eyes, dark skin, the blood type A+, shovel-shaped front teeth, and that he was genetically adapted to cold temperatures, and to what extend he was predisposed to certain illnesses. This is important as besides four small pieces of bone and hair, no human remains have been found of the first people that settled the New World Arctic. Willerslev's team can also reveal that Inuk's ancestors crossed into the New World from north-eastern Siberia between 4,400 and 6,400 years ago in a migration wave that was independent of those of Native Americans and Inuit ancestors. Thus, Inuk and his people left no dependence behind among contemporary indigenous people of the New World. "Our findings can be of significant help to archaeologists and others as they seek to determine what happened to people from extinct cultures. Doing so requires organic material - bones or hair kept as museum pieces or found at archaeological sites. Previously, the DNA needed to have been frozen or buried in a layer of permafrost. But with the new methods developed here at the Centre, that is not a premise anymore". Much of the hands-on work analysing and joining the DNA sequences and the chemical analyses of what little was left of the damaged genetic material together to form a complete profile of Inuk was done by Morten Rasmussen. The work was carried out in close collaboration with other scientists at the University of Copenhagen and in China, where they have far more sequencing machines than in Denmark. "Not so long ago, reconstructing an entire modern human genome took years," Rasmussen says. But the new methods and the abundance of sequencing machines allow us to do it in just a few months - and that includes the time-consuming task of analysing the results. The interesting thing about compiling a human genome is that we can look at the genes to see traits like why Scandinavians are blonde, why some are predisposed to certain illnesses and why others more easily become addicted to alcohol or tobacco. But the genome we've reconstructed is no Frankenstein's Monster; it's more like we've got the blueprints for a house, but we don't know how to build it." The results of the team's research will be published in the leading British scientific journal Nature. Professor Eske Willerslev, tel. : +45 2875 1309 or PhD student Morten Rasmussen, tel. : +45 2860 0400. 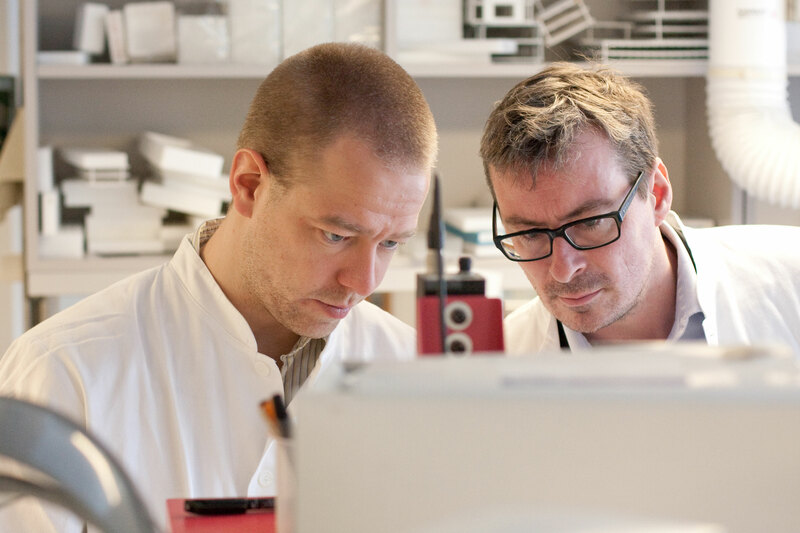 Morten Rasmussen and Eske Willerslev in the lab. 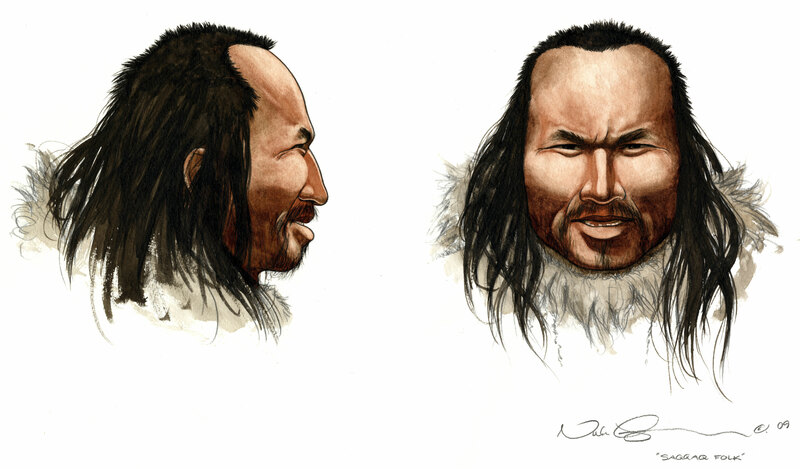 Reconstruction of the prehistoric man Inuk. Photos can be used freely in relation to mentioning of the research and by crediting the artist.